Let’s take a little look into the past: FOLLOW THE CIPHER‘s story started in May 2014, when Ken Kängström decided to start a band with the intention to be different from everything else in the music scene. The idea itself had been haunting his mind for years, but the catalyst to finally put his thoughts into action was the result of a longtime collaboration with the internationally acclaimed metal giants SABATON, with whom FOLLOW THE CIPHER maintain a close friendship. Ken Kängström is definitely not a newcomer in the Scandinavian music scene, since he wrote and produced some well-known SABATON songs, such as the monumental anthem ’Carolus Rex‘. It was this track which got the ball rolling: “I think the song sparked the first inspiration in me – in particular, it was responsible for me starting to trust my own abilities and judgment,” Ken reflects. “When I wrote this track, I felt deep inside that it was time to put my plans with FOLLOW THE CIPHER into action.” Therefore, the band has also included a version of this important track, ’Carolus Rex‘, on their debut album. 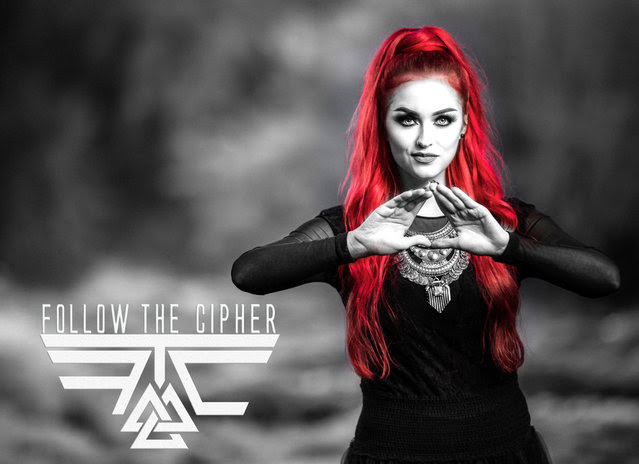 FOLLOW THE CIPHER is an ambitious troop, not only do they express their passion through their music, but also through their extravagant outfits and impressive live shows.